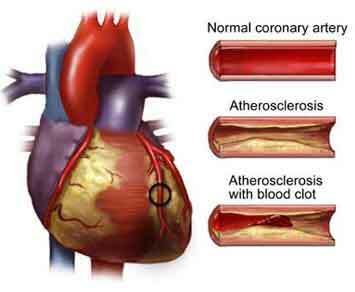 Atherosclerosis is when the arteries harden and become narrower. This is so detrimental because it slowly blocks arteries, putting blood flow at risk. 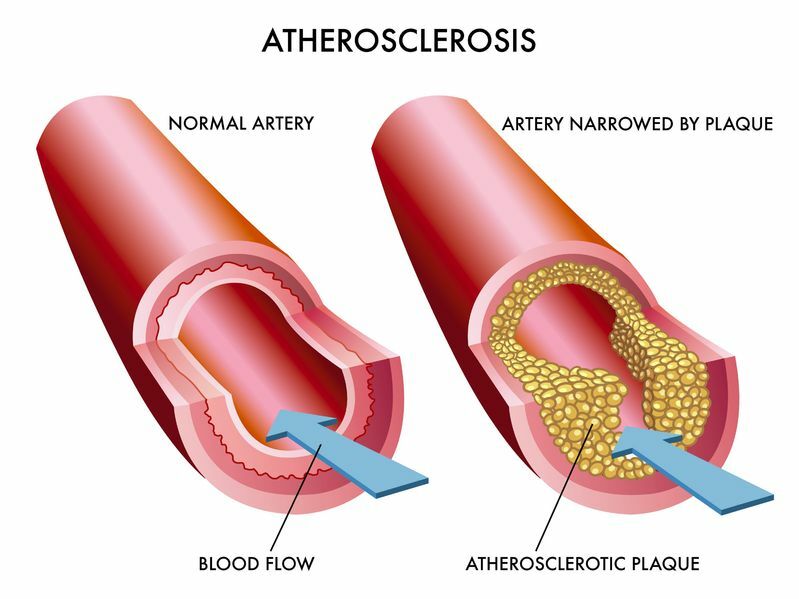 Atherosclerosis is usually the cause of heart attacks, strokes and other peripheral vascular diseases, what are called cardiovascular diseases. Cardiovascular disease is the number one killer of people in the United Staes, more than 800,000 deaths in 2005. Arteries are blood vessels that transport blood from the heart to the rest of the body. The arteries are lined with cells called endothelium;, The endothelium works to keep the arteries toned and smooth, which will keep the blood flowing. According to medical experts atherosclerosis starts with damage to the endothelium caused by smoking, high cholesterol, high blood pressure. The damage then leads to growing plaque. When LDL or bad cholesterol moves across the damaged endothelium, the cholesterol penetrates the wall of the artery. This cause the white blood cells to flow into digest the LDL. Over the time, the accumulation of cholesterol and cells becomes plaque across the walls of the artery. Plaque a mixture of cholesterol cells, and debris that creates a bulge in the artery wall. As atherosclerosis continues to progress, the lump becomes larger. When this become more significant, it creates a blockage in the artery. This process continues through the entire body. As a result, the heart becomes at risk and risk for stroke and other health issues. 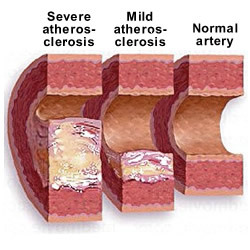 Atherosclerosis usually will create no symptoms until middle or older age. However, as artery narrows, it becomes more severe, and chokes off blood flow and can start to cause pain. Blockages can rupture unexpectedly, causing blood go clot inside in the artery at the site of the fracture. Plaques from atherosclerosis can behave in different ways. Plaque stays within the artery wall. Plaque can grow to a particular size and stops since the plaque dies not block flow; it never causes symptoms. Plaque can build in a very slow controlled way into a path of blood flow. Eventually, it causes massive blockages, Pain on exertion in the chest, or legs is a common symptom. In acute cases, plaque can rupture without warning, allowing blood to clot inside an artery. This is strokes in the brain and heart attacks when they occur in the heart. Atherosclerotic plaque causes three different types of cardiovascular disease. Coronary artery disease: This occurs when stable plaques inside the heart’s arteries cause angina (chest pain due to exertion ) the plaque ruptures and blood clotting, causing the heart muscle to die. This is known as a heart attack or myocardial infarction. Cerebrovascular disease. When arteries in the brain are damaged due to ruptured plaques, leading to potentially permanent brain damage, this is called a stroke. Tempory blockages in the artery can cause transient ischemic atta cs (TIAs); which are warning signs of a stroke, however, there is no brain damage. Peripheral artery disease: This diseases is caused by narrowing of the arteries in the legs due to plaque causing poor circulation. This will cause pain from walking and poor wound healing. Severe disease may lead to amputations. Atherosclerosis start early. Today large number of asymptomatic young people have evidence of atherosclerosis. A 2011 study of 262 seemlingly healthy people hearts indicated 52% had some atherosclerosis. 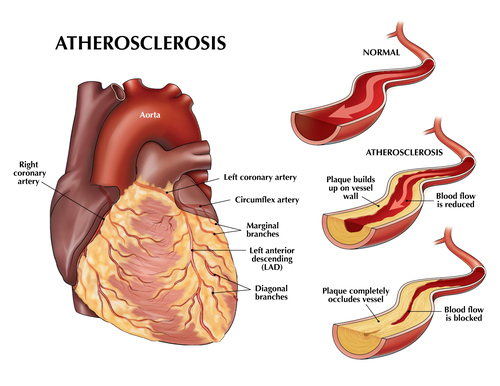 Atherosclerosis was present in 89% of people older than 50 years old. 17% of teenagers had atherosclerosis. None of these people have shown any symptoms. Very few had svere narrowing of their arteries.This was a very early disease, detectable by a particular test. If someone is 40 years old and healthy, he/she would have a 50% chance of developing serious atherosclerosis in his or her lifetime. The risk goes up as one ages. The majority of adults older than 60 years old have some form of atherosclerosis, however, they may not have any symptoms. The positive news is that Rates of death from atherosclerosis have fallen by 25% over the last 30 years. this is due to people living better lifestyles and improve treatments. Atherosclerosis is a progressive yet preventable disease. There are nine risk factors that are the cause of 90% of all heart attacks. By taking a daily action, you can prevent the likelihood of getting atherosclerosis. If you are are moerate to higher risk- individuals that had a stroke, heart attack or suffer angina, taking a baby aspirin daily can be significant. Aspirin helps prevent blood clots from forming. You should ask your doctor before taking daily aspirin. Once a blockage has started in the artery, is normal stays there. With medication and changes to your daily lifestyle, plaque may slow or stop growing. Plaque can shrink slightly with aggressive treatment. Lifestyle changes that reduce the risk of atherosclerosis will slow or stop the growing process. With a healthy diet, exercise and no smoking, the lifestyle changes will not remove blockages but will lower the risk of getting an heart attack or stroke. Medication could be drugs or high cholesterol, and high blood pressure will slow and maybe halt the progression of atherosclerosis, as well as lower heart attack risks and strokes. Cardiac catheterization with angiography of the coronary arteries is the most common angiography surgery performed. Using a thin tube inserted into the artery in the leg or arm, doctors can access diseased arteries. Doctors can see blocks on a live X-ray screen. Angioplasty (catheters with balloon tips ) and stenting can open up a blocked artery. Sting helps reduce symptoms. However, it does not prevent heart attacks in the future. Bypass surgery – SUegrousn use health blood vessels, usually in the chest or leg, to bypass segment blocked by atherosclerosis. These procedures all have risk involved with complications. However, they are done on people with significant symptoms or limitations from atherosclerosis.